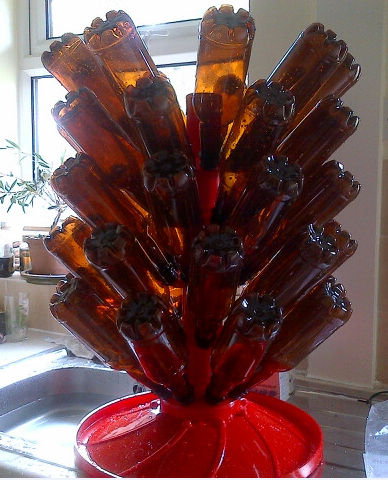 Home Brew Project Update – the Tasting! Around 5 weeks ago, I embarked on a home brew project – brewing my own beer because it was something that interested me but also, because potentially, I could save money by not buying alcohol in my weekly shop! I had all the equipment I needed but a couple of weeks ago, ended up buying a bottle drainer (£20) as I needed to wash, sterilise and dry all my bottles easily before I bottled the beer. So, from my initial batch of beer, I was able to bottle 43 bottles (500ml). Cost now works out @ £1.80 per pint or around £1.60 per bottle, still not a bad price. My beer has been bottled for over 20 days and I thought it was time that I cracked one open to try. All in all, I was pleasantly surprised – the beer was quite clear, with only a tiny amount of yeast sediment at the bottom (barely noticeable) and was easily drinkable! Whilst the beer kit that I used was a lager kit (Coopers Australian Lager), my beer tasted rather more bitter than a lager and had an ale kind of golden/amber hue to it. Alcohol-wise, I don’t think it’s that strong, less than 4% ABV. I’m really pleased with the initial results and have heard that brews get better the longer you leave them so I’ve got something to look forward to over the coming weeks/months! I’m glad that rather than just go off the instructions in the box, I decided to do my own research and sought out home brew forums and websites to find out what was what. All you parents out there will recall how your newborn baby’s bottles etc were meticulously sterilised? In home brewing, the brew is the ‘baby’, so anything that touches the brew needs to be sterilised first to get rid of any potential nasties. The worse thing you can do is to spoil your batch just because you were too lazy to sterilise properly. 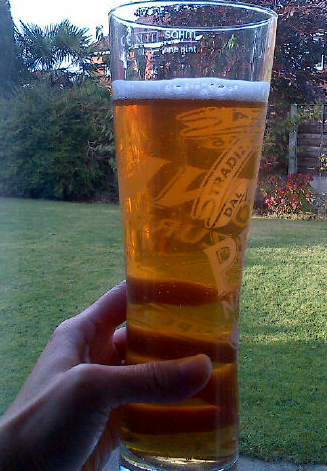 A lot of patience is required – I didn’t quite realise how long it would take for a homebrew to be at its “best”. Whilst the instructions on the beer kits talk in terms of your beer being ‘ready’ in 2 weeks, those “in the know” recommended at least a month, although I was really tempted to try before then! Finally, there are tons of YouTube videos on ‘how to’ homebrew – watching these gave me confidence that I was doing things the right way! So, I’ve learned a new ‘skill’ this year and embarked on a new hobby. Am looking forward to making my next brew! I admire your desire to follow through on something like this. It's made an interesting read too. Many people 'talk' about doing things like this, but it's nice to see someone go for it and share their experience. I feel very satisfied from tasting tomatoes or potatoes that I've grown in the garden, is beer the same? For what it's worth, it looks good! Are you going t try try something new for you next batch? or, are you going to try improving this one? All the best either way! It was good to learn something new and see it through. I've been guilty in the past of talking about doing something (even spending money on kit/equipment) but never getting round to it. Perhaps I could set myself a challenge…learn something brand new each year! At the very least, it'll just add to the list of hobbies I already have for when I retire! I think you tasting your own tomatoes or potatoes that you've grown is exactly the same as me tasting my home brew beer – it was very satisfying that I'd made it myself! I'm planning on a different beer kit next time (a more premium one) – so will see how that one goes! My husband brewed his own for awhile and I really liked the beer and I am not much of a beer drinker. He is talking about doing another batch and splitting it with someone. You are right about everything being sterile – he did a batch of wine and it spoiled. Hi May, as mentioned to Huw above, it was very satisfying to drink my own beer. I can't say that it'll win any brewing prizes but I'm sure I'll get better the more I make! I'd heard of stories about brews spoiling so was really particular about sterilising! Thanks for stopping by!